This last weekend the Sheffield Steelers of the Elite League Ice hockey league here in the United Kingdom clinched the championship for this year. After beating the Newcastle Vipers 4-1 on the road, the Coventry Blaze lost to the Hull Stingrays, mathematically eliminating the last team that could challenge Sheffield for the title. According to Sky Sports, there was "a wild night of celebrations in South Yorkshire," though I will admit I was up in Sheffield on Sunday, and must have missed the celebrations. The coach of the Steelers is Dave Matsos, who is from my hometown. I believe I went to school with his brother, but I'd have to go and check my old year books, which currently are in a storage locker near Toronto airport, and thus not exactly accessible to me right now. ...a pretty town centre. 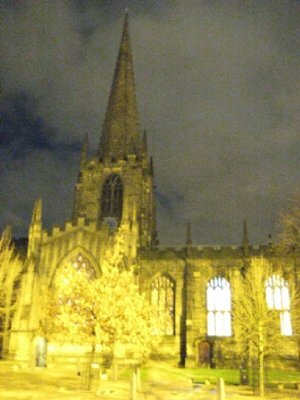 That's because, for the most part I haven't actually made it out of Sheffield town centre. The train station, my hotel and my office are all within a 10 minute walk of each other in the town centre, so that's mostly what I have seen so far. The name of the hockey team, though, gives a clue that Sheffield isn't all pretty town squares and pedestrian malls, but has an industrial past and future. 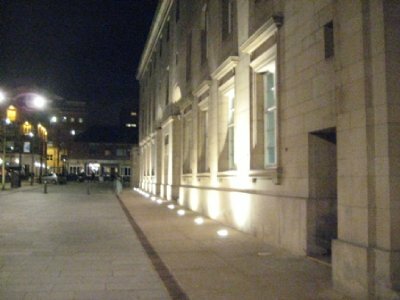 There has been a long line of innovations in the steel industry and metallurgy in Sheffield, dating back to Benjamin Huntsman creating the "crucible technique" in the 1740s, which allowed the wide-scale manufacture of steel. Stainless steel was invented in Sheffield, and the process for silver-plating cooper was invented here, the metal becoming known as Sheffield Plate. Secondary to the steel industry in Sheffield, but probably more important across the entire region (known as Yorkshire) was coal mining. Last week marked the 25th anniversary of an event related to coal mining that shook the foundations of the United Kingdom. In 1984, the Thatcher government announced the closure of 20 coal mines, putting twenty thousand miners out of work. The coal mining union was very powerful, and the government had prepared for a long action by the miners. They had stock piled coal and converted power stations to burn gas instead of coal. On March 5th, 1984, the members voted to strike at Cortonwood Colliery in Yorkshire, starting what would be a year long strike that spread across almost all the coal mines in the UK. On the 15th of March, David Jones, a miner aged 23 and father of two, was killed picketing in Ollerton. Mr. Jones was the first to 10 deaths related to the strike that would occur over the year. The strike broke the union, and after the strike was settled, pits started to close. In 1984, before the strike, 180,000 miners working at 170 pits across the UK. By August 2006, the UK coal industry was reduced to employing around 5,600 people. Today, most the closed mines have been reclaimed for other uses. The site of one of the most violent battles of the miners strike was at Orgreave, where about 5,000 pickets faced up to nearly 6,000 police on the 18th of June. Orgreave was closed in 2005, and is now being redeveloped as a site for housing and commercial interests, including a hi-tech advanced manufacturing park in association with Boeing and Sheffield University. Sheffield and Yorkshire haven't forgotten their history of mingin, though. There has been a number of events around the region this past week to mark the 25th anniversary of the start of the strike. For me, stuck without a car in central Sheffield, though, I haven't gotten to see much in the way of any of these events. 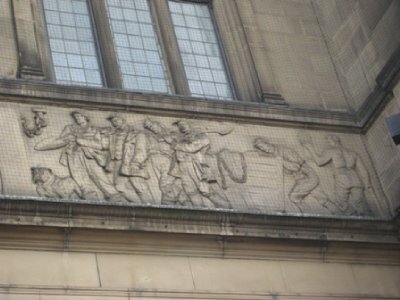 There is, though, a frieze on the town hall that commemorates a nubmer of the industries and people that made up the history of Sheffield, including one panel dedicated to the mining past of the region. 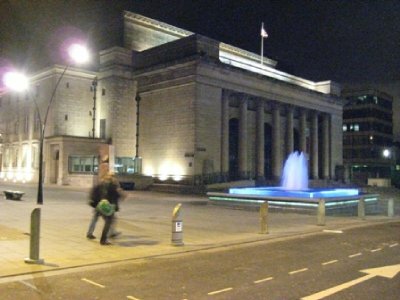 With the frieze, as Sheffield continues to change, the past won't be lost.